I don't have a recipe to share with you today, but I do have links to some things that I have made in the past few weeks that have been oh. so. scrumptious. For reals. 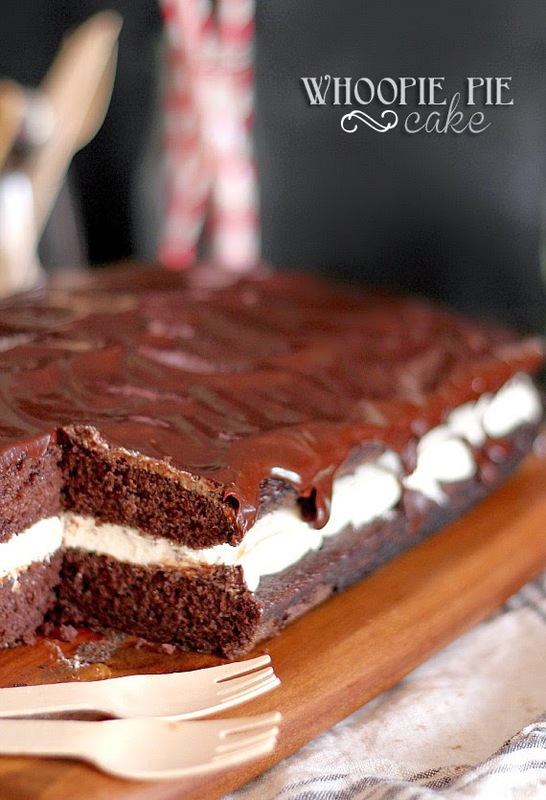 First up, and I don't have a picture for this so I'm borrowing one, Whoopie Pie Cake from Cookies and Cups. You guys, this was like a throwback to the middle school days when I used to gorge myself on Little Debbie Snacks and not even think twice about it. It was like a Swiss Cake Roll but even better and it could not have been easier to put together. I found the recipe when I was at a loss for what to make for our Thursday night community group. I usually try to bake up some kind of treat and that week I was just not feeling up to anything time consuming or that required me to go to the store. I looked at what I had in my pantry: a box of cake mix, a giant jar of marshmallow fluff and Dulce de Leche. Having had the marshmallow fluff in there awhile I was determined to use it. Somehow in my googling of what to do with a cake mix and marshmallow fluff I came across the Whoopie Pie Cake and my life was forever changed. It was a huge hit with the group, probably one of the things they have raved about most, and I have been looking for every excuse to make it ever since. Next recipe, Vanilla Cupcakes with Dulce de Leche Frosting, from the combination of this recipe and this recipe, both from Joy the Baker. Again, for our Thursday night group, I was trying to use up things in my pantry. As I listed before I had a huge jar of Dulce de Leche that I had never done anything with and I have not stopped making stuff with ever since I opened it to make these cupcakes. Melted in my coffee? The perfect start to my day. Drizzled over apples? A healthy afternoon indulgence. Spoonful straight to my mouth? It's addicting, what can I say! Anyway, I have made the vanilla cupcakes before, unfortunately never with the vanilla bean because I never have one on hand. Always with Mexican vanilla though because there really is nothing better than Mexican vanilla. I've only used regular vanilla extract once in my life and have vowed never to ever, ever again as long as I live. You need Mexican vanilla in your lives and in your baking people. 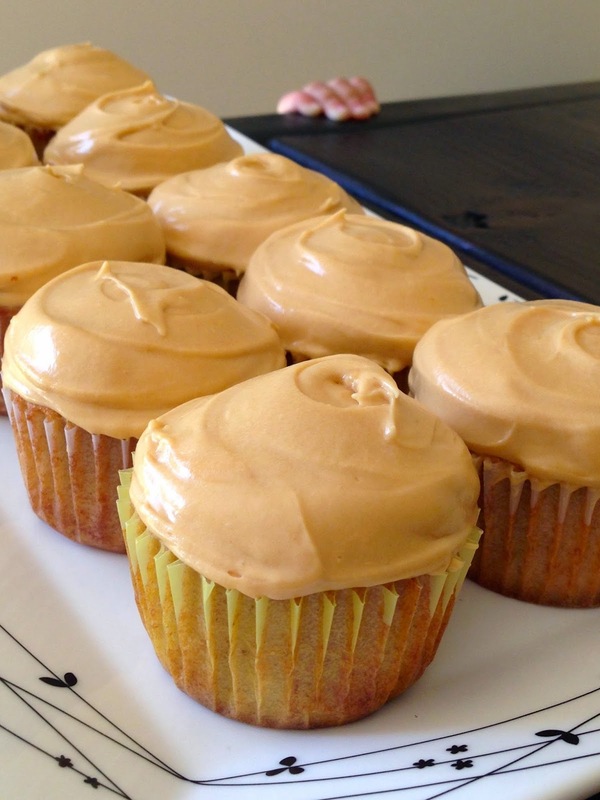 You also need this Dulce de Leche Frosting in your life and in your belly. Apparently Eli thought so too as he tried to reach his little hand up for one. The cupcakes are a great standard vanilla cupcake but this frosting took them over the top. 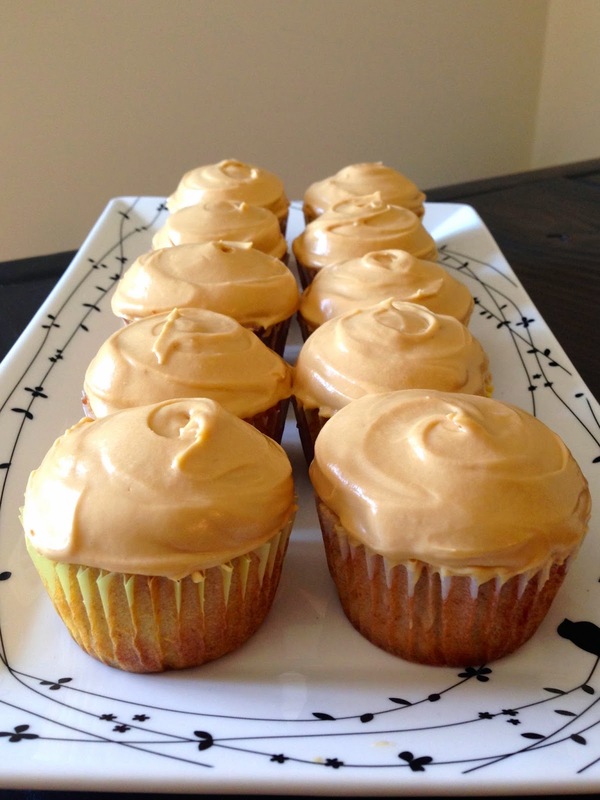 You could make the Dulce de Leche cupcakes of course like Joy and I'm sure they would be even more glorious. I can't remember why I didn't do that, but whatever my reasoning, the vanilla worked out just fine and allowed the frosting to shine in all of it's creamy, caramelly goodness. Last recipe, ridiculously huge Peanut Butter Cookies with Milk, Dark and White Chocolate Chips and chopped Peanut Butter Cups on top from Mommy's Me Time. I read about these a few years ago on a blog I follow called Espresso and Cream. She claimed this was the "World's Best Cookie Recipe Ever" so of course I had to try these out. The only problem was, I could not be trusted with these cookies if I made them just for Luis and myself. Plus they're HUGE! I know, I know, I could make them smaller, but if I was going to make the World's Best Cookie Recipe Ever, I was gonna do it up right. And that's exactly what I did. I dug out my ice scream scoop and scooped giant cookie dough balls onto my baking sheet and patiently waited the 12 minutes before pulling them out, sprinkling chopped Trader Joe's Dark Chocolate PB Cups (it's what I had on hand) on top and returning them to the oven for their last 2 minutes of transformation. As usual, my dessert loving son was waiting for his chance to pounce on these. He was even so bold as to take one himself. There were tantrums to be had when he realized that wasn't how things worked. The recipe called for milk chocolate chips but I had several partial bags of chocolate chips in my freezer so that's how they ended up becoming filled with milk chocolate chunks, semi-sweet chocolate chips and white chocolate. It added another flavor dimension to these already insanely good cookies. And there you have it, recipe inspiration if you're in need of it. Disclaimer: I cannot be held responsible for any over-consumption, diet-shattering, fat-pants days that any of these goodies may induce. But I can promise you each bite will be totally worth it. Guten Appetit!